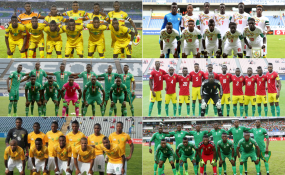 As the Flying Eagles jet out today for Guinea Bissau for the first leg of the 2019 U20 AFCON qualifier on Saturday, Plateau United striker, Peter Eneji has assured that the team will not disappoint. The Flying Eagles missed the last edition hosted and won by Zambia. Nigeria has won seven titles and according to Eneji who played in the 2018 CHAN in Morocco, the Flying Eagles will make a bright start. "I am convinced we will win in Guinea Bissau," the Plateau United winger declared. "We are going to play for our country in that clash away from home and as a team we know what is at stake we have prepared well, we have been in camp for a while now, we are going there with a mentality to beat them at home. "There is no small team in football any longer, but preparations and quality will separate the two sides." Eneji also said he is delighted to have regained full fitness in time to make the 20-man squad to Bissau. "I am pleased to make the list considering the fact that I was injured but I'm now back and better," he said.